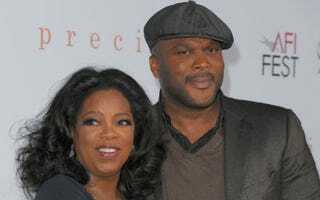 Hollywood's highest-paid man and woman have joined forces, with Tyler Perry signing a deal to produce shows exclusively for Oprah Winfrey's OWN network, including two new scripted series set to premiere in mid-2013, CBS News reports. If the combined effort of these two wildly successful media moguls doesn't get the network the ratings it's been after, we don't know what will. "I have been looking forward to the day when we would be in the position to enter the world of scripted television. That day has come," Oprah said in a press release. "We are all energized by the opportunity to collaborate with Tyler who has a proven track record for producing highly successful cable series. He has an incredible ability to illuminate life stories and characters in his unique voice and inspires and encourages people all over the world." Perry — who in the past has produced the sitcoms House of Payne and Meet the Browns for TBS — also expressed his excitement at the new opportunities that will come about as a result of the new deal. "It's a dream realized to partner with Oprah and bring scripted programming to OWN," he said in a statement. "She has accomplished so much with the network and I'm excited to work with her to be a part of its continued growth." This partnership could give the Winfrey-Perry team an unprecedented type of control over the images of (what we assume will be) black people on television. Can they handle it?